Thank you for considering a donation to Holyoke Merry-Go-Round. There are many ways you can support the work we do! The Holyoke Merry-Go-Round relies on our friends for the financial support necessary to maintain our historical treasure. Our Merry-Go-Round does not receive local, state or federal funding. Tax-deductible donations may be made to the Preservation Fund or our Operating Fund by check or online. Click the below link to make a donation online today. Preservation Fund donations back the ongoing horse restoration of the precious Merry-Go-Round horses, as well as antique organ repairs to the 1929 Artizan band organ and building. 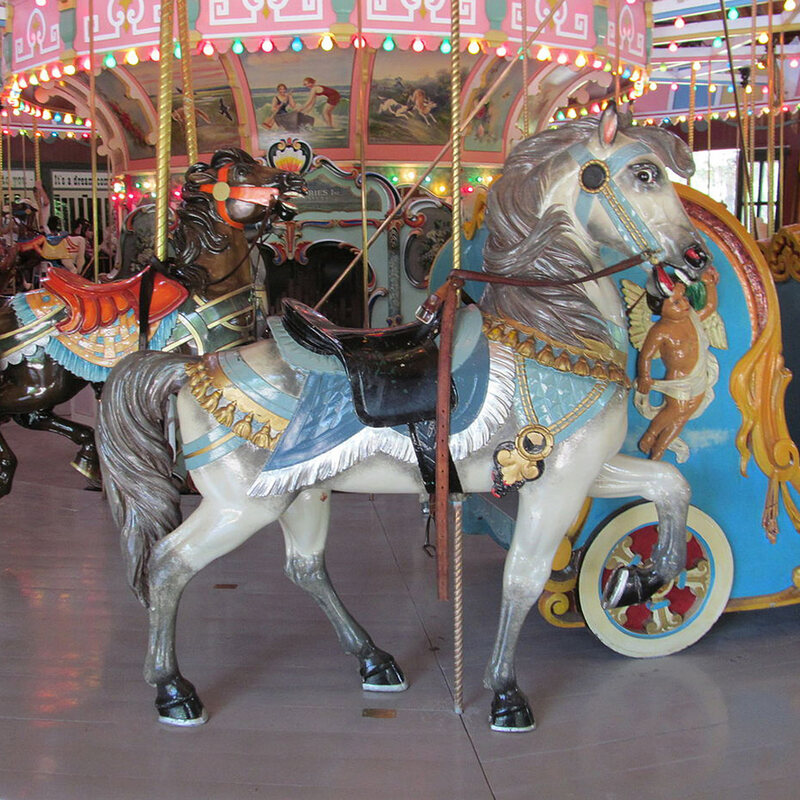 Funds received allow the Friends of the Holyoke Merry-Go-Round to continue providing a high standard of reliability and safety; donations are used to address mechanical breakdowns, extraordinary repairs, maintenance, paint the building, preserve building signage, repair the antique organ, replace the hundreds of colored lightbulbs and more. Thanks to the generous donations we have received from individuals and grant funding, we have we have successfully restored 27 of our 48 antique, hand-carved horses since October 2003. 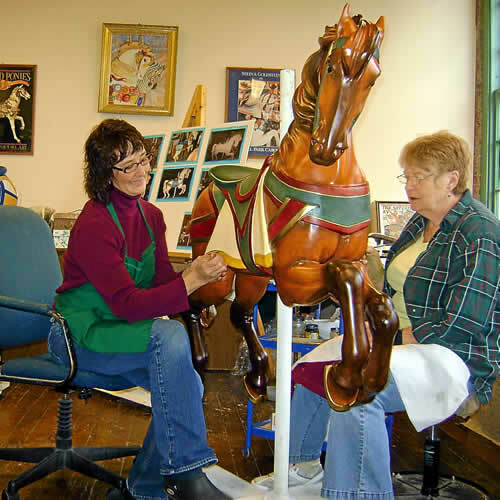 The process is still ongoing; we are working on restoring inner and middle row horses to their original magnificence. This horse restoration process can range anywhere from $4,000 to $5,000 per horse. Our Operating Fund was established in 1993 to offset operating costs such as continually increasing energy and insurance costs as well as other expenses necessary to keep our Merry-Go-Round twirling. These expenses amount to more than our ticket, merchandise and party sales can support and are necessary to allow us to provide affordable entertainment to the region. To recognize or remember a special person, family or event with an inscription on our permanent Donor Board, a donation of $125 can be made in their honor or memory. 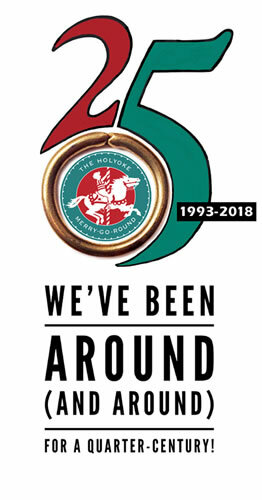 To make a tax-deductible donation to either the Preservation Fund or the Operating Fund by check, please make your check out to the “Holyoke Merry-Go-Round,” indicate the fund you wish to make your gift to, and send it to Holyoke Merry-Go-Round, 221 Appleton St., Holyoke, MA 01040. To make a $125 honorary or memorial donation, email friends@holyokemerrygoround.org or call (413) 538-9398.